For at least a decade, we've been hearing about how Millennials are killing everything. They can never put a positive spin on things. So imagine my delight when I learned we could actually save something. We could save the post office. But before I get into all of that, I just want to point out how obvious it is that nobody knows what a Millennial is. They use the age group 18 to 34 to represent Gen X in 2001, and Millennials in 2017. As someone born in 1983, the hinky-ness of that age group stood out to me immediately - I was 18 in 2001 and 34 in 2017. I'm somehow in two generations. The last year that Gen X included 18 year olds was in 1998. The more you know. 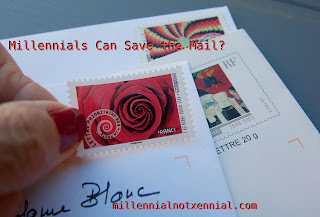 Can Millennials save the post office? The article states that Millennials love getting mail because it makes them feel special, but don't like sending it because it's effort. I will point out that I don't mind the effort if it makes me feel like I'm making someone else feel special, and I actually found a fun way to do that thanks to a YouTube binge gone weird. Sealing wax is fun, especially when you allow yourself to experiment. And trust me, I have sent letters to international countries, too, so it will go through the mail, if you keep it thin enough to go through the machines. If it gets too thick, they're going to charge you extra postage and you have to have your mail hand canceled. But making someone feel special and playing with fire may not be enough to save the post office, and that's not on Millennials - that's on the post office. First of all, I don't imagine how anyone could trust the mail in Wisconsin after it was first discovered postal workers were stealing money from the mail, but then the mail in two communities just completely vanished on September 4. And it's not just Wisconsin. A postal worker who quit dumped a lot of mail in New Jersey. There's a story that happened a while ago that I can't remember all the details to now, but there was one postal worker in New York that got so flustered with trying to deliver the mail on time, they just stashed it and never delivered it. The post office has a huge mess on its hands. And with 75% of these news stories about the news being so fresh, the post office proposed raising stamp prices a whopping 5 cents for a one ounce letter, bringing the price up from $0.50 to $0.55. So the post office wants to charge you more for the gamble you take when you put something in the mail. I love sending mail, and I think if craftier Millennials saw how fun creating mail pieces can be, they would love sending it more, too. But knowing that mail could be lost and that it's becoming more and more expensive to send it, it makes me wonder why anyone would want to get on board if they weren't already. The post office needs to work out its own issues, but when it does - maybe Millennials could help make mail fun again. And if not us, maybe our kids.